In the Talmud it says, "Whoever saves a life, it is considered as if he saved an entire world" (Tractate Sanhedrin 37a). That text immediately came to mind after I heard the news that my cousin, Dr. Jeffrey Gudes, brought a man back to life a couple weeks ago. Jeff, 27, was playing hockey in the Troy Sports Complex when a player on the opposing team collapsed and had a heart attack. 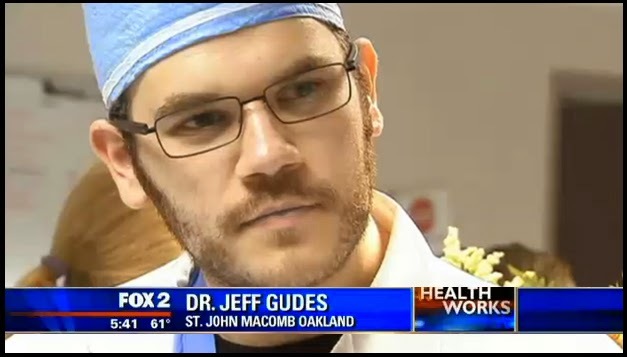 Jeff's a surgery resident at St. John Macomb Hospital in Michigan. His teammate immediately called him to the other team's bench where Jeff performed chest compressions and used the automated external defibrillator (AED) to revive the man before he was taken to the hospital. The man was unconscious while Jeff was working on him, but Fox 2 News Detroit brought the two men together to meet now that he's out of the hospital and feeling better (he won't be playing hockey for a while). As we approach the Days of Awe in the Jewish faith, we consider the haunting words from our liturgy's famous prayer, the Unetaneh Tokef: "Who will live and who will die?" I know our grandfather, Dr. David Gudes, would be extremely proud that the young Dr. Gudes saved a man's life, granting him more years on this earth. I too am very proud of my cousin Jeff, he acted quickly and responsibly, performing the greatest mitzvah possible. Your cousin is an excellent doctor and a mentsh. Hopefully throughout his long medical career he will have the privilege of saving many more lives and thus many more worlds, as our Talmud says. Kol HaKavod to cousin Jeffrey Gudes ,,Yishar Koach!, and Shanah Tovah. Your cousin is a great doctor and mentsh and hopefully he will have the chance to save many more lives and thus many worlds. The duplication is a mistake, however, as we say it in Hebrew: טובים השניים מן האחד״ meaning: the two are better than the one.